Radish masala | mullangi masala is a easy and delicious gravy made with radish and serves as a perfect side dish for chapathi | roti and even for dosa too. It even goes will with jeera rice too. I learnt this recipe from my friend's mom. When i went to her house to learn the triangle samosa recipe, i saw her cooking this radish masala. I noted down the masala recipe and this recipe i have given in the Aval vikatan Supplement magazine which i gave in 2014. We always make make radish sambar, radish paratha and sometimes add in salads but this side dish for roti is quite simple and yum too. I have slightly altered the recipe given by aunty. 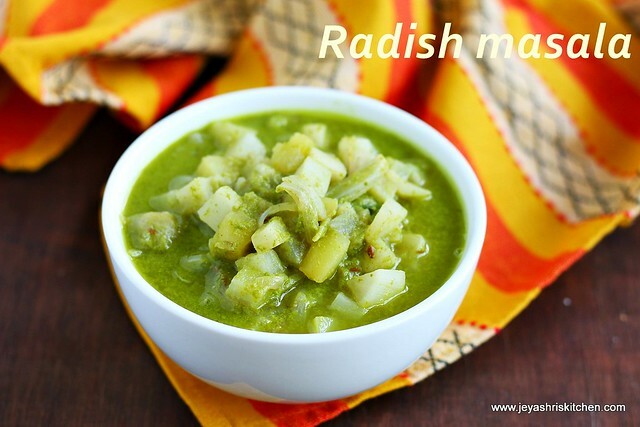 Enjoy this radish masala and let me know how it turned out. Cut the radish and potato into small cubes. Slice the onions into long. Soak the cashew nuts in hot water for 10 minutes. You can replace cashew with 2 tsp of chutney dal |pottukadalai. In pressure cooker, add oil and add in the cumin seeds and cinnamon. Saute for few seconds and add in the onions. Add little salt to this and cook the onions till translucent. Now add in the cut radish and potato. Keep the flame low and saute for a minute. Grind the coriander, green chili,soaked cashew nuts and ginger into a fine paste. Add this ground paste to the pressure cooker. Add 1 cup of water and little salt and the curry leaves. Switch off the flame and once the pressure is released open the cooker and mix well. If needed add little more water and give it a boil. If you feel the consistency is perfect, no need to boil. Cashew nuts can be replaced with gram dal | chutney dal. Curry leaves can be tempered along with cumin seeds in the beginning. You can add 1/4 tsp of garam masala also if you need. 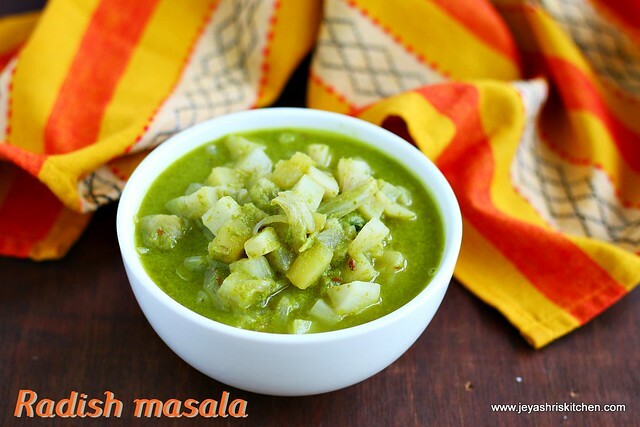 You can add carrots |green peas to the radish masala gravy. This recipe looks very good .Down south in Karnataka almost the same recipe is called saagu.